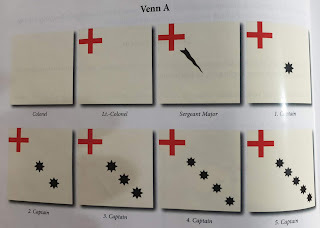 Part three of the KeepYourPowderDry guide to Civil War flags and colours looks at where we can see illustrated examples of Civil War flags, and also where we can get some for our armies. 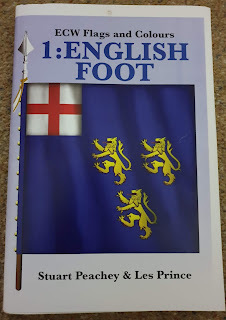 First off we have to consider the three volume series English Civil War Flags and Colours from Partisan: Volume 1 covers the English Foot, Volume 2 Scots Colours, and Volume 3 the Bill Carmen collection. Volume 1 has an absolute wealth of information inside including coat colours, but is quite hard to read due to font and printing technique. Black and white illustrations, the book is quite dated in appearance. If a second edition with modern typesetting and colour illustrations was available it would be a surefire winner. £10.50. Despite it's shortcomings this still demands a place on the bookshelf. Part two of the KeepYourPowderDry guide to Civil War flags and colours looks at evidence - surviving flags, and contemporary records. Sir John Gell's on display at NAM. Antony House, Plymouth have a yellow ensign on display with black lion devices (possibly Alexander Carew's Cornish parliamentarian regiment of foot). This is the first of three KeepYourPowderDry guides to Civil War flags. This part looks at the rationale and rules why Civil War flags looked like they did. Not often I get to channel my inner Dr Sheldon Cooper, I doubt it will ever happen again. To understand Civil War flags we need to know some nomenclature, some heraldic conventions, and the regimental flag systems used. 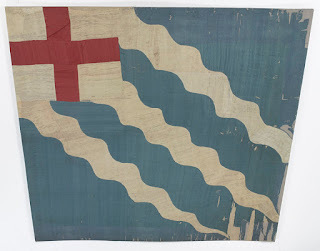 Regiments of foot carried ensigns, which were about six feet square, sometimes a little bigger at six feet six inches square. These were carried on short staffs and on occasion twirled enthusiastically. Ensigns were rallying points during the chaos of battle. We know that some were made of silk, and others taffeta. Looking at John Gell's colour on display at the National Army Museum we can see that the designs were stitched on. There is some evidence that designs were sometimes painted on to flags. A bit of an afterthought it has to be said: Tate Britain leaves me, well a little underwhelmed to be brutally honest. However, what has piqued my interest is an exhibition of William Dobson's portraits. Dobson was held to be the finest English born portrait artist of his age, and became artist to the Charles's Royal Court in Oxford. He pretty much took over once Van Dyck was no longer on the scene. A small exhibition, which is on display until the end of this month, so you'll need to get a wiggle on if you want to see it. 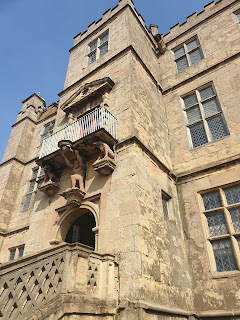 Bolsover Castle: mmmm, I hear you say. Besieged? Nope. Battle of? Nope. Home of William Cavendish the Marquis of Newcastle, and commander of the King's northern army? You'd be correct. Okay, so there wasn't a big dust up here in the seventeenth century, but if you get a chance to visit, it's well worth it. Like several grand houses in Derbyshire, Bolsover had a Royalist garrison, which was a bit of a thorn in the Parliamentarian side. Troops from the garrison venturing out to disrupt Parliamentarian activities, and gather supplies. On one occasion an "agent" was sent to Derby to sow discord and incite rioting. Home to the Cavendish family, William entertained King Charles and his Queen, Henrietta. William was an accomplished horseman, and was to become Charles II's riding instructor. 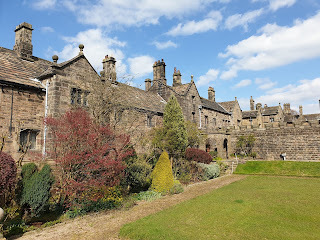 A castle existed on this site from the eleventh century; Charles Cavendish, and then his son William, undertaking a major rebuild in the early seventeenth century. Back in the day when this blog was knee high to a grasshopper I wrote an entry about visiting Naseby, with a picture of the obelisk and a few postcodes for some of the landmarks on the battlefield. I also vowed to return. I have. 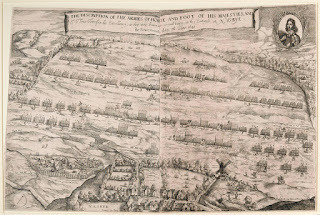 So here is a more definitive (and up to date) visitor's guide to Naseby battlefield. In my previous blog entry I suggested using a Battlefield Trail Guide from The Naseby Battlefield Project website; I found this to be pretty vague and struggled to follow it at time; so, here is my guide to the locations. There are audio clips available (NBP) which relate to the different locations (since my last visit there is now good 4G coverage over almost all the battlefield).